Mine is the original The Legend of Zelda. It'll have to be a tie between the original Zelda and Mario Bros. Both zeldas tie in sencond place. And the rest of the games in the OK zone. Mine is Balloon Fight, followed by SMB. I haven't played all of them yet, so my opinion on them is subject to change. Haven't played them all, so this WILL change lol, but I like Yoshi. Right now Super Mario Brothers and Balloon Fight are my faves, but I'm also digging Metroid. Since I've never played Metroid or the Zeldas I need to start looking up some info or maps so I know where I should be going. I also need to read up on some of the others, as I'm just guessing what to do right now. 9 & 10 will eventually be deleted. Despite being addicted to Yoshi and it being the gane I have by far played the most, I like Metroid the best. It really brings back memories. It also might influence it a bit because I have only played 4 of the 10 titles so far. 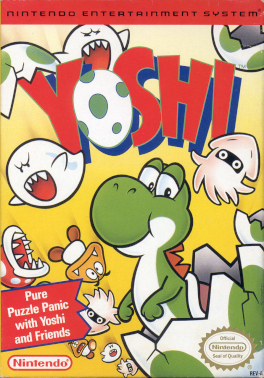 Yoshi is so much fun and addicting. I know that back in the day Nintendo made numerous Tetris copycat games, do not take that as a bad thing. It seems as if Doctor Mario is the only remaining and surviving of these games, which is a huge shame because I would love to play a revamped Wario's Woods, or Yoshi, because the originals are simply fantastic! Oddly enough, I like Super Mario Bros the best. LoZ is a veeeeeeeeery close second though. My favorite is Balloon Fight, I'm addicted to it! Right now my High score is only 44,600 but I just can't stop playing. I haven't even tried the other games yet. At my age I should be sick and tired of these old games. Strangely enough I'm not though. The classics never get old. I'd say the best of all is probably the original Zelda. It just has such a nostalgic place in my heart. Plus it's almost two games in one with the 2nd quest. I like NES Open Tournament Golf. Mainly because I had a million of those old-school golf games when I was younger so it is a good nostalgia trip.